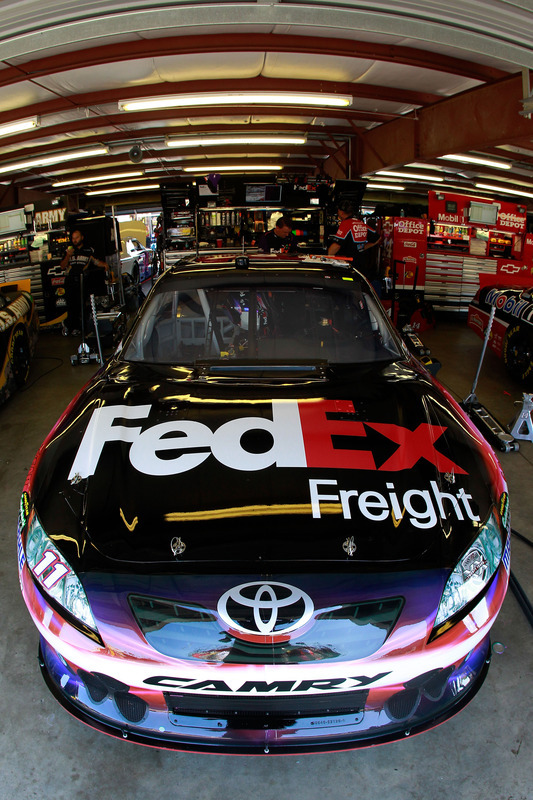 The FedEx Racing team played the fuel strategy game to perfection in Sunday’s NASCAR Sprint Cup Series race at New Hampshire Motor Speedway, overcoming early track position, a mid-race spin and an ill-handling race car for a hard-earned, third-place result. Denny Hamlin restarted third with 56 laps to go on the one-mile oval and worked into second behind leader Ryan Newman as both were trying to conserve fuel to make it to the end of the 301-lap race. Hamlin saved enough gas to take the checkered flag third behind Newman and Tony Stewart, who passed the #11 FedEx Freight Toyota with less than 10 laps to go. 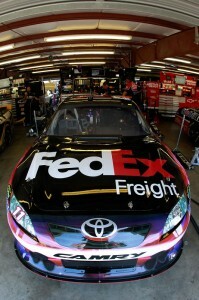 “It was such a hard-fought race for this FedEx team,” said Hamlin, following the event. “It’s so hard to save fuel when you know you’re running down the leader, but you have to look at the risk versus the reward. We were headed for a top-three finish if we saved gas, but could’ve finished outside the top-25 if I pushed the issue and ran out. We fought the car all day, and to come home with a third-place finish is about as good as we could’ve asked for.”Hamlin started 14th and battled a loose race car early in runs on the relatively flat New Hampshire track. Giving up a few positions on restarts while waiting for the car to come around, Hamlin battled back in traffic to maintain pace in the top-15. Differing tire strategies by teams on pit road shuffled the #11 between 10th and 20th through the race’s midpoint, with crew chiefs and drivers jockeying for important track position. Shortly after a restart on Lap 167, a chain reaction led to contact to Hamlin’s left-rear, sending him spinning in Turn 2 as he was collected by another car just as the incident settled. The #11 Toyota suffered left-rear damage and Hamlin came to pit road for repairs. Luckily, the damage wasn’t significant and Hamlin restarted 32nd, before slicing his way back through the field into the top-20 when a caution for debris came out on Lap 216. Hamlin pitted one lap later for air pressure and track bar adjustments — his final stop of the day — with instructions from crew chief Mike Ford to conserve fuel as the team was approximately five laps short. The adjustments brought the car to life, and as the #11 machine worked into the top-10 and many lead lap cars came to pit road during the final two cautions on Lap 226 and 241, Hamlin found himself in third on the Lap 245 restart and saved enough to make it to the end. The finish keeps Hamlin 10th in the NASCAR standings following New Hampshire, 82 points behind new leader Carl Edwards. The Sprint Cup Series enjoys its final off-weekend of the season before returning to action at Indianapolis Motor Speedway on July 31.